At least two councillors at the central area committee of Dublin City Council earlier this month ignored nearly 600 public submissions on Liffey Cycle Route when they were debating how the cycle route would affect the Croppies Acre memorial park. Cllr Ring, who is a serial objector to cycle paths, was asking if there was conflict between spending money on cleaning up the park now with large changes planned linked to the Liffey Cycle Route. Other councillors echoed this, however, IrishCycle.com understands only a small section of the park would be effected by the cycle route, if it goes ahead. 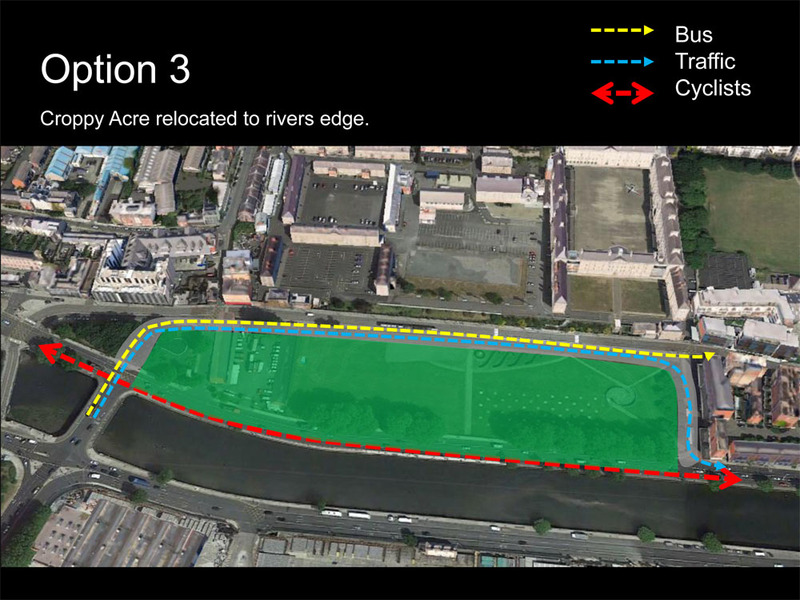 Option 3 for the Liffey Cycle Route — the most popular option to date — involves extending the Croppies Acre park to the river-side, where there would be walking and cycling paths along the river. This would be part of an overall continuous route from the Phoenix Park to the Point Village. To allow for the extending of the Croppies Acre park to quayside the current quays road would have to be removed — the current four lane road (three traffic lanes and a bus lane) along the river would be replaced by a three lane road (two traffic lanes and a bus lane) at the back of the park beside the Luas tram tracks. Cllr Ciaran Cuffe (Green Party), who has publicly stated his dislike of the creating the replacement road, said that there are currently four options and that the final option could be a combination of these.